Spain international Xabi Alonso is a player that epitomises the type of footballer Liverpool manager Rafael Benitez wants to have at Anfield. Since taking over from Gerrard Houllier, Benitez has preached the gospel that future success is dependent on possession and passing. Alonso is a player that can not only pick out a pass, he is also a player who will invariably find his man. So much so that against Norway in a Euro 2004 play-off he made 98 passes. Not that passing and his knack of bringing other players into the game are the only features of the Alonso repertoire - the Basque midfielder is also noted for his ball-winning ability. Before Euro 2004, Alonso had looked set to join Real Madrid, before Florentino Perez opted to turn his attention towards Patrick Vieira. Sociedad president Jose Luis Astiazaran had been in talks with Perez over the 22-year-old Alonso but the two presidents were unable to reach an agreement. Real Madrid offered Sociedad £8m plus a player, while the Basque side wanted £13m with no part-exchange arrangements. Born in the Basque town of Tolosa in Guipuzcoa, football is in the Alonso family genes. His father Periko was part of the Sociedad side that won successive league titles in the early 1980s. Periko also coached Sociedad for a brief period two seasons ago before he was replaced by John Toshack. Alonso's elder brother Mikel, another midfielder, is also a member of the Sociedad first-team squad. Alonso has said in the past the reason he joined Sociedad was that former manager Javier Clemente saw the midfielder playing football in the street at the age of 16 and immediately signed him for the Basque club. 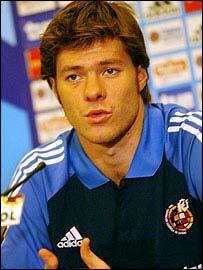 Alonso first played for Sociedad in the 1999/00 season. He then spent the first half of the next season on loan at SD Eibar before getting an extended run under Toshack. Alonso's performance in January 2001 against Basque rivals Athletic Bilbao had Toshack eulogising about the young midfielder. "I don't remember a former youth team player causing such an impact at the club," said Toshack at the time. "Everyone seems to play better when he is on the pitch." That season Alonso's midfield performances were key to Sociedad avoiding relegation. Over the next years under the guidance of Sociedad's new French coach Raynald Denoueix, Alonso established a reputation as one of La Liga's most accomplished midfielders. Other European clubs such as Manchester United and AC Milan also began to track his progress after Sociedad's 4-2 win over Real Madrid at Anoeta, when Zinedine Zidane was left trailing in Alonso's wake. During the 2002/3 season Sociedad ran Real Madrid close for the Spanish title, though the Madrid club eventually finished as champions. 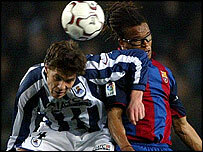 Sociedad finished second in an impressive campaign that saw Alonso score 12 goals. Alonso's rapid development also saw him called up to the international side and he responded with an impressive debut in Spain's 4-0 victory over Ecuador in May. Last season Sociedad found it difficult adjusting to playing in the Champions League as well as mounting a challenge on the domestic front. Alonso also suffered in the adjustment and the midfielder managed just three goals, though that trio of strikes included a magnificent volley against Valencia. Liverpool keen to reestablish its former tradition of passing, movement and possession under Benitez should be a fitting stage for the younger Basque midfielder.